In a wide, heavy, non-reactive pot, combine and cook wine, shallot, salt and pepper over medium heat until reduced to about 1/4 cup. Reduce heat to low and begin whisking in butter. Add butter slowly and whisk continuously to maintain an emulsion. Once butter is incorporated, remove from heat and taste for seasoning. Serving tip: Beurre blanc is at its best with fish. However, this delicate sauce goes well with poached chicken breasts or steamed artichokes. The quick difference between tender and sturdy herbs is this: is the herb pleasant to eat raw? Tender herbs can include chives, basil, cilantro, dill, mint, parsley, shiso, tarragon and chervil. The most famous tender herb mix is “Fines Herbs,” a mixture of parsley, tarragon, chervil and chives. 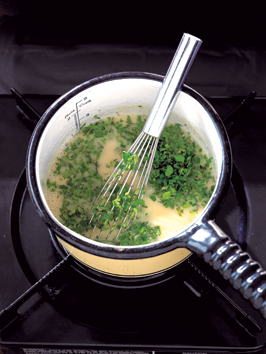 A beurre blanc (white butter) is a hot emulsion wherein the milk solids and fat of the butter remain in suspension. It’s a little tricky, but suave. If you are nervous, add a tablespoon of cream to the wine reduction before adding the butter. This will ensure the emulsion.